The name Deep Water Cay has been synonymous with world-class saltwater flyfishing since Gil Drake and A.J. McClane, the iconic Field and Stream editor, founded the property on the East End of Grand Bahama in 1958. When Paul Vanldiek saw the property back in the early 2000s, when it had been converted from a public business to a private club, he fell in love instantly. Vahldiek bought into the private club and enjoyed the retreats for years before being approached by the then-owners in 2009. The private club format had been successful for years but met an accelerated demise thanks to the economic downturn. Vahldiek has a proven track record of high standards, given the mix of financial success, ultimate luxury and conservationist responsibility he and his ownership group have shown with High Lonesome Ranch in De Beque, Colo.
How do you balance catering to the A-list traveler and being a steward of the land and sea? “It’s pretty easy when you commit to the idea of conserving the way of life into perpetuity,” Vahldiek said. “We don’t take more from the resource than it can heal itself. It needs to be part of every decision we make. We’re a working member of the community. 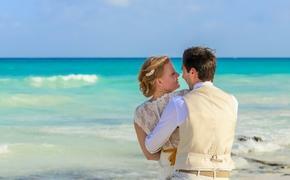 We created a sustainable business with a plan that fits into island life. 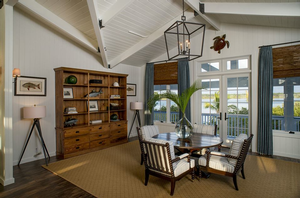 PHOTO: The view inside the renovated lodge at Deep Water Cay. For the first 55 years of its existence, the resort was a week-at-a-time destination due to its 250 square miles of world-class flats fishing. There were seven privately owned homes, seven cabana units and four guest cottages that felt more like a fishing lodge than a resort hotel. Vahldiek is an avid fly fisherman, but the key component to his plan was one that eluded his predecessors: the place needed to cater to the fisherman’s families as much as to the sportsmen. “We need to be busy 11 or 12 months a year, and to do that, you need to have buy-in from the wives and the kids,” he said. “I’m in no way abandoning the fishermen, they’ll be plenty happy during their peak season. We just want to bring the families in to fill out the rest of the year. So they brought in Charleston, S.C.-based interior designer Allison Elebash, who completely redid the lodge, the Blue Hole Bar & Grill, and several of the West End Cottages as part of the recent multimillion dollar renovation of Deep Water Cay. 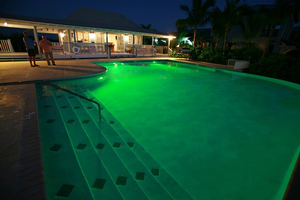 PHOTO: The Cay's pool, lit green in celebration of Masters weekend. One thing purposefully excluded in the renovation: there are no telephones or TVs in the rental properties. There is, by design, limited Wi-Fi access around the main lodge. The purpose? To foster a quicker disconnect from the stresses of the real world. The property features tennis courts, a fitness center, paddle boards, Hobie Cats and a number of other water sports watercrafts. Families can set out on scuba diving expeditions in blue holes that Scuba Magazine has recognized as some of the best spots in the world. Snorkeling in reefs and kayaking are also offered to guests, as well as a stunning infinity pool. The ownership group has also recently committed to building 53 new waterfront properties with Elebash on board for design (though at a $1.1 million price tag, owners are certainly allowed to bring in their own crew). The renovation has certainly caught the eye of the luxury travel crowd. Tom Brokaw, Michael Keaton and Liam Neeson have all stayed on property and raved about DWC. “As close to Heaven as is safe for sanity,” Neeson said. The trio were part of filming for Outdoor Channel’s “Buccaneers & Bones” fishing series, along with Patagonia founder Yvon Chouinard. “I’ve never seen such big bonefish in my life,” Chouinard said of his time fishing the waters of the cay. But Valhdiek is most happy about the feedback he has been hearing from families. And to the fishermen who have come before, he wants to make it clear they haven’t lost focus on what drew people there in the first place. 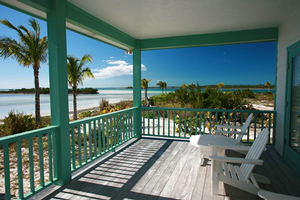 PHOTO: The view from the porch of one of Deep Water Cay's rental houses. Rising occupancy rates is also a clear indication the group is on the right path. Vahldiek hopes that 10 years from now, he’s getting close to the full vision for the land.